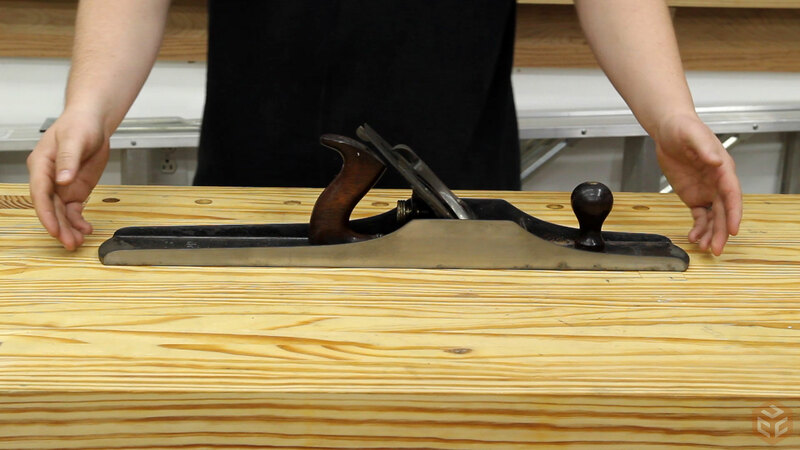 Everyone can benefit from having a hand plane in their shop even if you, like me, are primarily a power tool user. 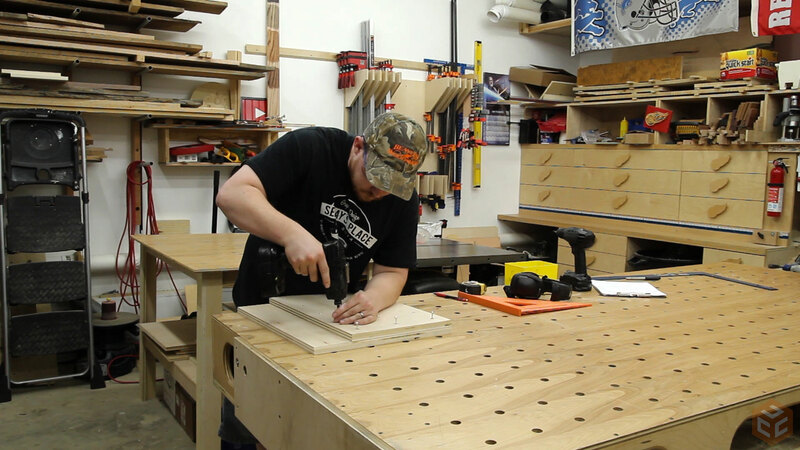 And anyone who has a hand plane in their shop can benefit from a shooting board. They go hand in hand (no pun intended). 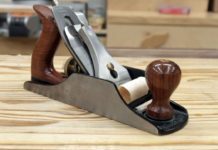 I quickly found out how convenient they are for certain situations shortly after making one for my low angle jack plane. Today I’m not making one for me though. I’m making a shooting board for a friend of mine who let me borrow his No. 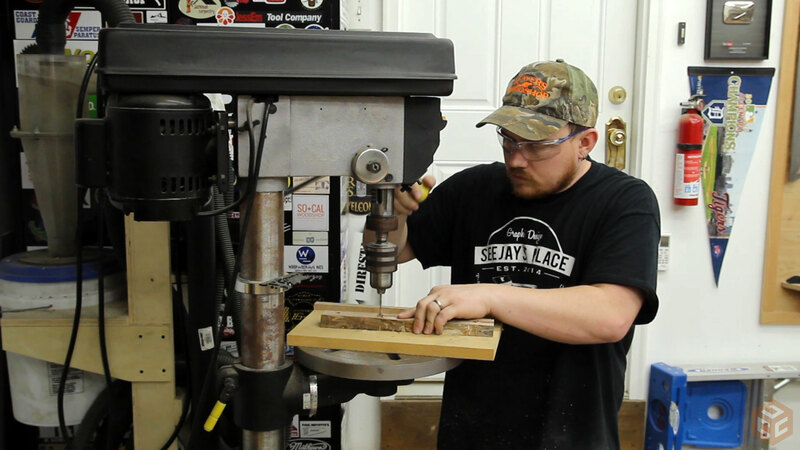 608 Stanley Bedrock jointer. After finding out I was interested in hand tools he brought over a few planes and said I could use them as long as I wanted to but I can’t have them. If I were to move away he would like them back. Letting someone else use your tools is a very kind gesture. Especially considering the 608 he brought over has some sentimental value to him. The plane was used years ago to rebuild the church he went to in his youth. The plane was in rough condition when he brought it over. All of the metal was full of rust and the sole had some pretty bad pitting going on. I did a light restoration on it. Basically I removed all the rust with EvapoRust, lapped the sole flat with some adhesive sandpaper on my table saw wing, and sharpened the blade. I did not alter the knobs or Japanning. 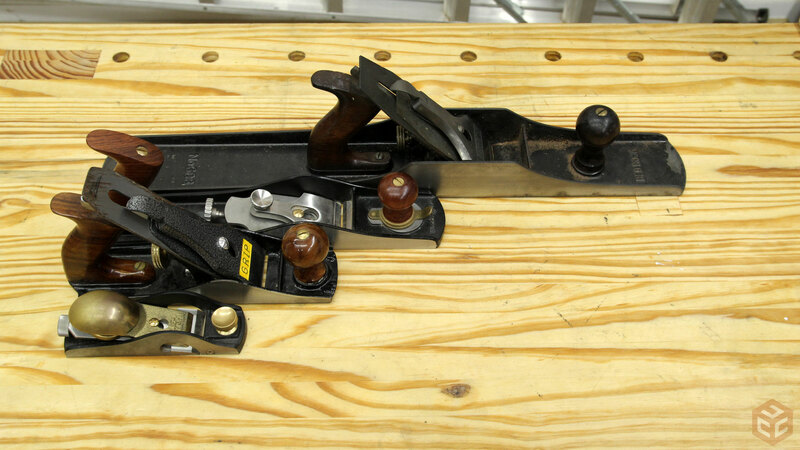 To give you a size comparison here is the same 608 next to my longest plane, which is a #62 low angle jack plane. Also pictured is a regular #4 and a low angle block plane. The 608 is HUGE! There are no such thing as a standard size when it comes to a shooting board. The dimensions I chose were based upon me already having a smaller shooting board and realizing it was a little too small for the 608. 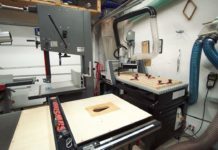 Looking back on this as I write this article I will say that a larger shooting board works with any size plane but a small shooting board won’t work well with a huge plane. The size I settled on had a footprint of 20” x 16” with a material platform of 20” x 12”. I cut these out of 3/4” plywood. 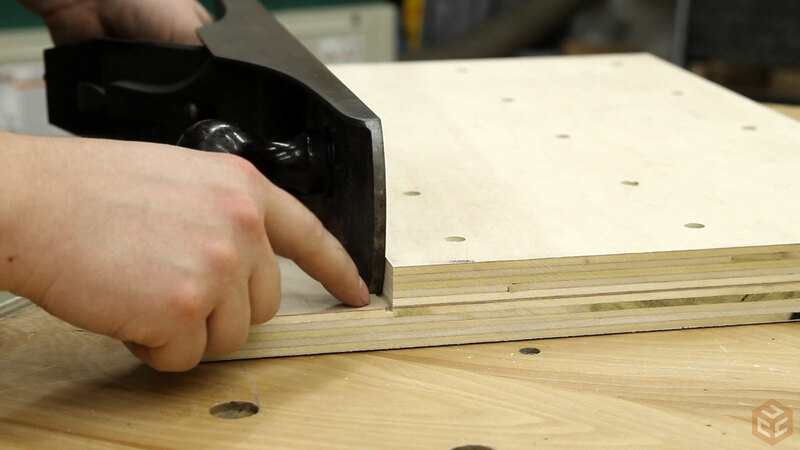 Securing the two panels together can be done however you want. I chose to just use a grid of screws instead of glue as I didn’t want to wait for glue to dry. Either way will work. You can see that both panels are 20” in the front to back direction and the 12” wide panel is stacked on the 16” wide panel with empty space to my right. If you’re left handed the empty space is on the left. Screws after predrilling. You might notice I used washer head screws into countersunk holes. It’s OK. They were the only screws I had on hand at that length. 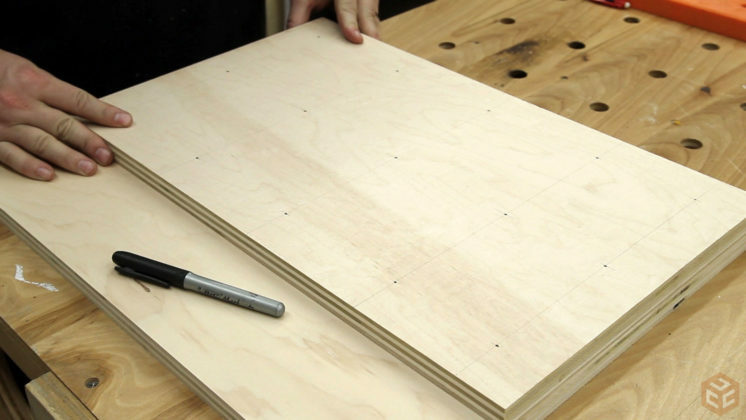 This is a tip I read online that I wish I would have done to my original shooting board. 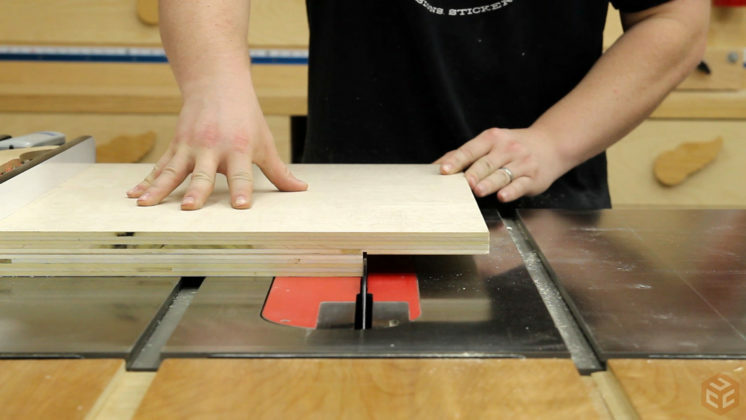 A simple dust groove is cut with the table saw before mounting the fence. Here you can see the relation of the dust groove to the position of the plane. For a rear cleat and a front fence I went with hickory. It’s naturally dense so it should wear very slowly and take the abuse just fine. It’s also a pretty nice looking piece of wood. I left the live edge on and just cut a piece off for the rear cleat. Because there weren’t a ton of holes I setup the drill press for counterbored holes this time as I was using the same washer head screws. The bottom cleat is secured making sure it is perpendicular to the sides. How far front to back you place it isn’t of much importance. Mine is about an inch inset from the bottom. For the top fence I chose a position that allowed full range of motion of the plane to pas the fence without it tipping forward. The reference surface of the fence is about 4” from the furthest edge of the shooting board and it is positioned so that it is slightly overhanging on the side where the plane will be. With the fence secured with one screw it can be positioned with a square to ensure that it is perpendicular to the motion of the plane. It’s worth mentioning that a little bit of candle wax will help a LOT when it comes to sliding a hand plane across wood. The same is true for a shooting board. Wax the side of the plane that will be on bottom. Next, the side of the fence can be trimmed up with the plane. This gets the fence as close to zero clearance as it will ever be. Inevitably over time you will accidentally tilt the plane into the fence and trim away a little bit. That’s OK as I will show you how to prevent tearout on your pieces in just a bit. 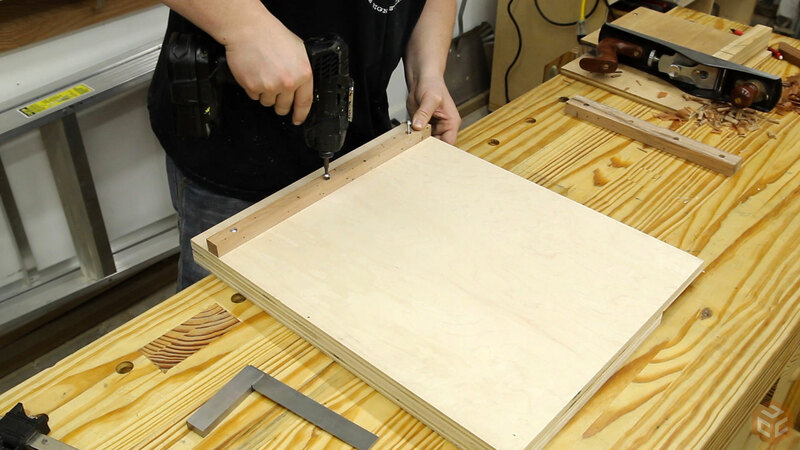 Use a scrap board to test for square. The vertical angle of the cut should be square. That angle can be adjusted by adjusting the blade angle on the plane. Also, the cut should be 90 degrees from the fence. If it’s not the fence can be tapered to correct this. If you have a shoulder plane the process is very easy. Just take multiple passes increasing in length until you take a full length shaving. 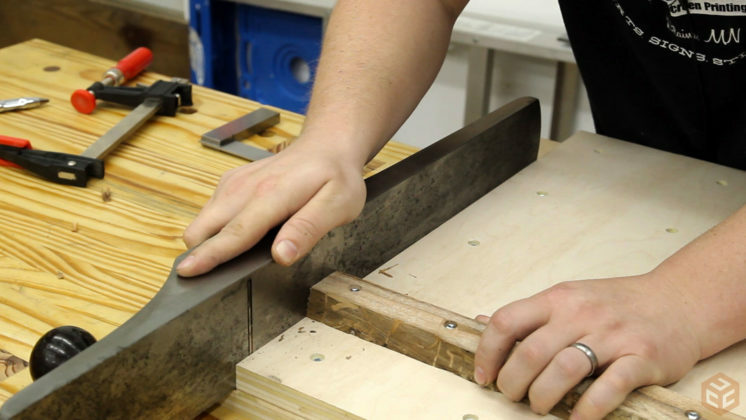 If you don’t have a shoulder plane simply mark the side that needs to have more removed, remove the fence, taper it with a plane in a vise, reinstall, and check your progress. It’s a little more time consuiming if you don’t have a shoulder plane but still easy to accomplish. This one was accurate enough to not require any adjustment. So what do you do if the zero clearance is not really zero clearance and you are getting tearout on the exit side of the cut? Simply flip the board over so that the side that was once touching the fence is now forward and purposefully angle it out like shown in the picture below. Then cut a tiny chamfer on the front corner. 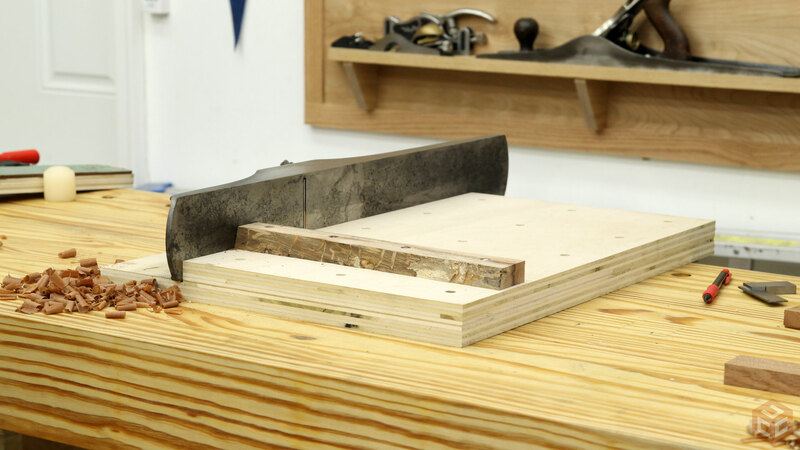 Flip the board back over so that the chamfer is at the exit side of the cut and plane away the end so that you reduce the chamfer down to nothing. So that’s it. A simple shooting board that doesn’t have a lot of complicated adjustments and simply works. 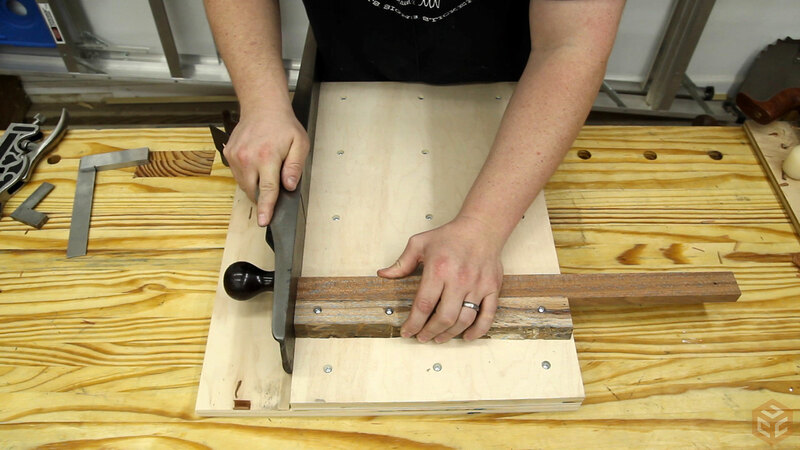 Like I previously stated, anyone who has a hand plane in their shop can benefit from a shooting board. 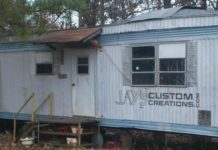 So go out to your shop and find a few scrap pieces to make one. Odds are you will be glad you did. 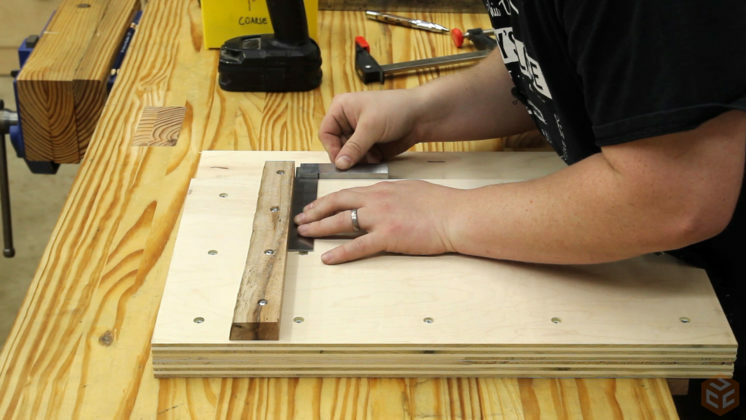 What keeps the plane from cutting into the edge of the base board that the work piece is sitting on? 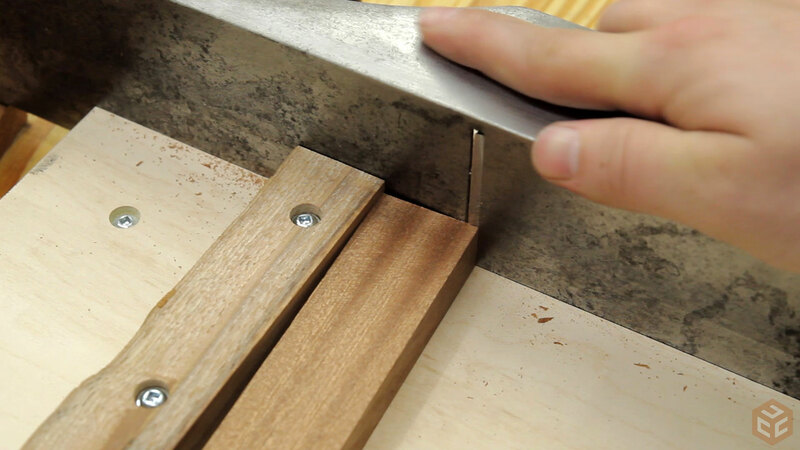 Isn’t the blade protruding beyond the base of the plane that you indicate is sliding on the edge of the base board? The material platform and the fence are both trimmed with the blade initially. 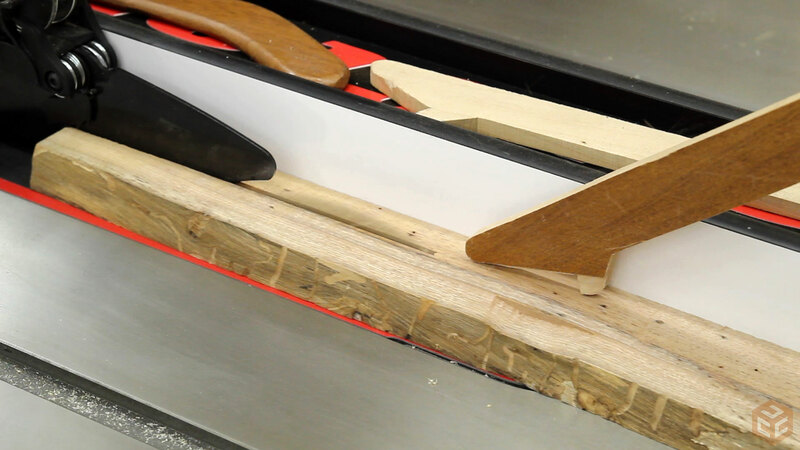 The plane blade does not go to the bottom of the material platform and therefore cannot trim the entire thickness of the surface. The area of the plane where the blade does not stick out still contacts the original side face of the material platform. The mouth (the hole on the bottom ) of most planes has four sides that envelop the blade. 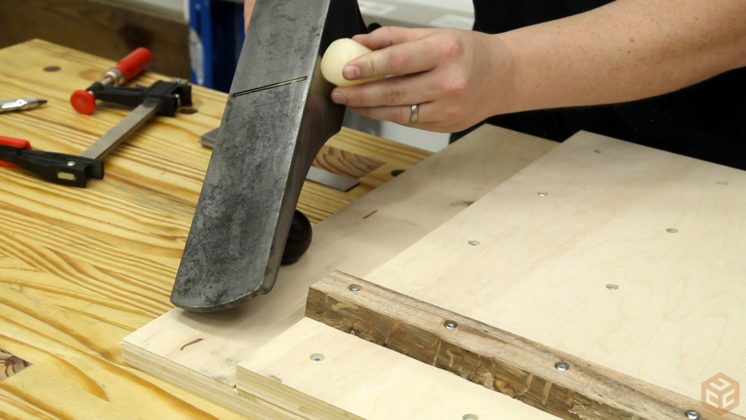 The left or right side(whichever is laying down on the shooting board base) will create a slight tongue that prevents the plane from cutting in to the shooting board once setup. This is why you cannot use a shoulder plane for a shooting board because the mouth is cut all the way through ( left to right ) on a shoulder plane. Could not have been more perfect timing for this! My low angle jack comes in tomorrow and a shooting board is definitely in its immediate future. Just curious what angle bevel do you use on your low angle jack plane and/or do you have multiple blades with different bevel angles? Thanks Jay! I am moving to the Houston TX area where humidity will be high and I will have my workshop in my garage. Should I apply a finish to the plywood? The only downside to adding a finish in my opinion is making the material surface slippery when holding material in place. I don’t think it would be that big of a deal though. Not a plan guy but I can see how the shooting board might be nice to have. My question is this about your table saw. 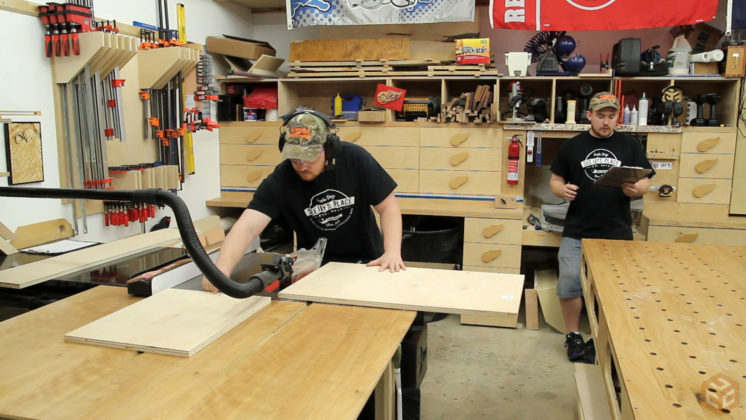 The dust collector you have over the blade is that something you came up with or did it come with the table saw? 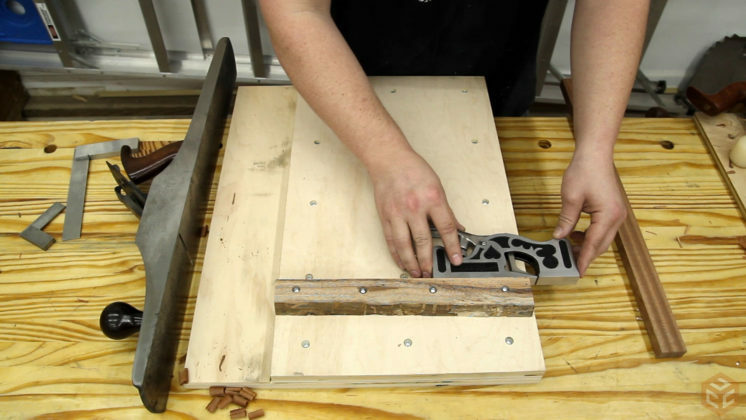 It’s an option for SawStop saws. Great video and clear explanations, but you missed an opportunity, IMO, by not adding 22-1/2 and 45 angle blocks (for octagonal and square frames, which are probably the most common use for a shooting board. This can be done with threaded inserts in the base board and the angle block making the parts stay in registration and wear better and longer. How about updating this video sometime to show this modification, and why not do it for you neighbor to make his shooting board more versatile. I hope you report the reaction of your neighbor when you return his plane with extra. Is it Shooting Board or Chuting Board?